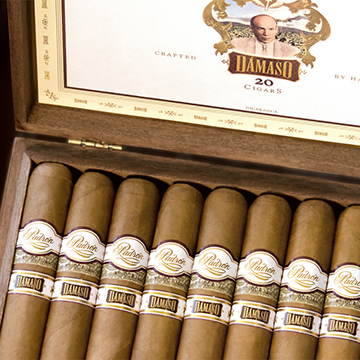 Padron's handcrafted Damaso cigars are named after company founder Jose Padron's grandfather, Damaso, the first Padron to arrive in Cuba from Spain's Canary Islands in the late 1800's and begin growing and cultivating tobacco. Blended with tremendous care at the Padron compound in Esteli, Nicaragua, the Damaso line is a first for this world renowned company on several levels, starting with its medium-bodied profile and beautiful Connecticut-seed wrapper. And, unlike the vast majority of the cigar lines under the Padron brand, the Damaso cigar is round rather than box-pressed. What Damaso does have in common with virtually every Padron cigar ever produced is its exceptional quality, character, and flavor. Blended with sun-grown, premium Nicaraguan tobaccos aged a minimum of 2 1/2 years, this milder Padron shares pleasant notes of cedar, cream, light spice, and pepper, and appeals to a wide range of cigar lovers. It's Connecticut done Padron style, which means the Damaso is a must try.